Shortwave radio has been around since the early 20th century, but it is arguably still one of the most simple and effective means of communication around. With a shortwave radio, you can tune into international broadcasts, listen to AM/FM radio in remote locations using relays broadcasts, participate in the ham radio community, and pick up emergency broadcasts. Any one of these applications would make shortwave radio a worthy purchase. The fact that you can do all of this with just one device is incredible. If you are thinking about buying a shortwave radio, but you are not sure where to start, the product comparison table below can help you out. If you still are not sure what you need in a shortwave radio, read on to learn more about features as well as questions you should ask while shopping. A shortwave radio is a receiver which can pick up transmissions on frequencies up to 30 MHz, usually ranging between 1.6 and 30 MHz. These frequencies work well over very long distances, which is why shortwave radio is used for international broadcasts and why it is also sometimes referred to as “world band radio.” This is also what makes it ideal for relay stations and emergency communication. Where will you be using the shortwave radio? Shortwave radios are available in desktop or portable configurations. If you will be keeping your radio on a desk in one location, a desktop model makes sense. But if you need something compact and lightweight that you can carry around, you should shop for a portable model. Portable radios lack the wide range and high sound quality of desktop radios, but they usually include more power options (battery, hand crank, etc.). 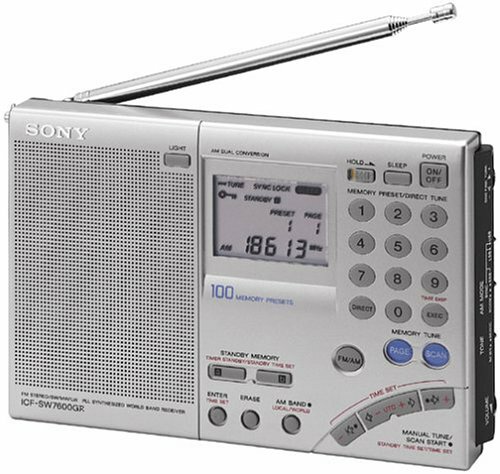 You can also shop for what is known as an “all-in-one” radio, which is a shortwave radio that also can pick up AM/FM stations. Desktop radios are often all-in-one radios, but this is less common in portable units. How will you be using the shortwave radio? Answering this question will also help you to determine which type of shortwave radio you should buy and what features are important to you. 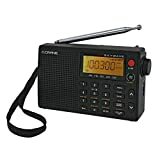 If you are buying shortwave radio to listen to AM/FM relays in the country, different features will be important to you than those you would look for in a shortwave radio for emergencies. How many frequencies can you pick up on the radio you are thinking of buying? Most radios will offer you a range between 1.7 MHz and 30 MHz, but you can find some models which range from 0.54 MHz up to 30 MHz. The wider the frequency range, the better. Both analogue and digital frequency displays are available. Analogue displays can save you money, but digital readouts are far superior. You can get much more detailed and accurate data on frequencies with a digital display. With analogue, it is hard to tell when you are on the exact right frequency. While it is common for shortwave radios to tune AM mode stations, there are some which transmit using SSB or additional modes. If you select a shortwave radio which offers AM, SSB and other modes, you will be able to tune into a lot more broadcasts. 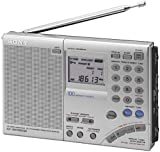 If you want to reduce the amount of interference you get from other stations while tuning into shortwave, then you should look for a radio which has narrow selectivity bandwidths. Usually on a portable radio, you can choose between two settings: wide and narrow. You will get more options if you are using a desktop radio, possibly up to five. If you want to boost the range of your shortwave radio, the best way to do it is by purchasing a longer aftermarket antenna to replace to built-in antenna with its limitations. Not every shortwave radio offers a jack for an external antenna, however, so you will need to make sure that the one you are planning on purchasing does. Another matter to consider when you are buying a shortwave radio is ease of use. Some radios include knobs for tuning while others include only buttons. Most users prefer knobs, and are especially happy with units which include knobs that turn very smoothly. This is not to say that a knob is the right choice for everyone, but this is a factor to think about before purchasing. This is a feature which allows your shortwave radio to lock onto signals more effectively. This helps to get rid of noise and fading, producing a strong, clear broadcast. This feature does typically add to the price of a radio, but it can be well worth paying a little extra for. The actual build of your radio is important too, especially if you are shopping for a portable model which you are planning to carry with you during emergencies. You want it to be robust enough to hold up to wear and tear. Pay attention to the dimensions and the weight while you are at it. Portable radios need to be compact and lightweight. Some models can be quite heavy, which could be a problem in an emergency. You now know what features and questions are important to consider when you are shopping for a shortwave radio. Shortwave radios offer incredible range and versatility, and have numerous applications. If you are ready to start shopping, then scroll back up to the top of this page to look again at our comparison chart. If you hate fiddling with digital buttons and prefer to use analog knobs to dial in radio stations, you might enjoy using the Tecsun PL880. It’s got very good reception for a portable, especially when it comes to AM/FM frequencies. Additionally the PL880 is surprisingly loud, thanks in large part to its 450mW amp. Excellent controls. Fans of the PL880 love its old school knobs and dials. Good battery life. The PL880’s lithium batteries will run for hours and hours before they need to be recharged. Loud speakers. This radio’s 450mW audio amplifier allows you to crank it up when you need more volume. Excellent AM/FM reception. 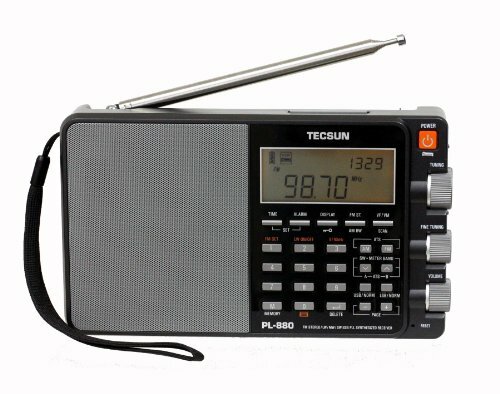 The PL880 is extremely good at picking up faint AM/FM signals. USB port. If there is a computer or laptop nearby, you can siphon power from its USB port. Backlighting. The backlight can be configured to switch off immediately or stay on for several seconds. Comes with a case. The PL880 is one of the few portable shortwave radios you’ll find that comes with a carrying case. Other portable shortwaves do a better job of filtering out interference. This shortwave does have a sync detector, but it doesn’t work very well. If you’re looking for a classic shortwave radio that’s loud, durable and portable, you’ll be very happy with the ICF-SW7600. This device’s origins date back to the late 70s and every feature has been refined and tweaked to perfection. The ICF-SW7600 is not the best shortwave for playing music, but news and talk radio stations sound very crisp and clear. 25 year old model. Sony has been perfecting the ICF-SW7600 for over two-and-a-half decades– and it shows. Heavy duty construction. This very solid metal shortwave radio is incredibly sturdy and well-built. Professional features. The ICF-SW7600GR’s synchronous detector allows you to lock on to faint, far-away stations. Excellent reception. This radio is quite small, yet surprisingly powerful. Portability. You can carry this shortwave radio with you wherever you go. Intuitive controls. Beginner shortwave radio enthusiasts will appreciate this product’s easy-to-use interface. Energy efficient. The ICF-SW7600GR has better battery life than most other portable shortwaves. The ICF-SW7600 is made for talk radio, not music. Voices come in loud and clear, but songs don’t sound very good. 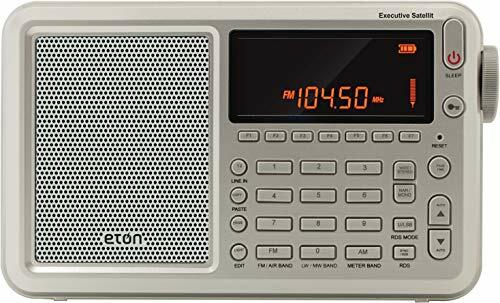 If you are looking for a fully featured shortwave radio which you can use on a variety of different bands, take a look at the Eton Grundig Executive Satellit. This compact device is perfect for home or travel use, and gives you access to all the channels, news and commentary you are after, no matter where you are in the world. Access a wide range of bands. These include AM, FM, LW and SW. You can also listen to the VHF aircraft band as well as Single Sideband (SSB). Compact design. This is important since you probably want to be able to take your shortwave radio with you while you are traveling around the globe. Includes a leather cover. This stylish cover is elegant to the eye and provides protection for your shortwave radio while you’re on the go. Includes a headphones jack. You can decide whether you want to listen through the speakers in the radio or listen privately do your headphones. Helpful display. You can see the important information that you need at a glance on the radio’ s display, without being overwhelmed with unnecessary extra data. Long battery life. The radio takes four AAs. They can last quite some time before you need to change them, even if you are using your radio a lot. Adequate audio quality. The audio quality is not the best, but most casual listener should find it sufficient for their needs. Some units appear to be impacted by manufacturing flaws. They may arrive DOA, or may have other issues with construction or function. Looking for a well-designed shortwave radio which includes an abundance of enhanced features? 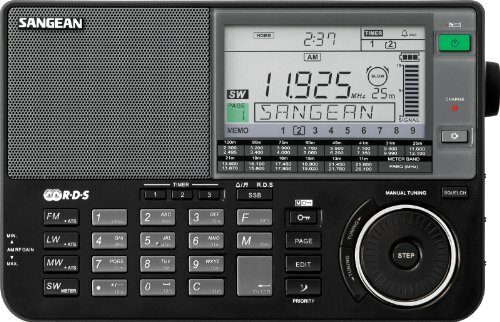 One radio to take a look at is the Sangean ATS-909X. This high-quality radio offers superior performance and comes with all the accessories that you need. Lots of presets. This radio allows you to store up to 351 shortwave preset stations, along with 27 FM stations, 18 AM stations and nine longwave stations. You can also store a single priority preset. Headphones jack included. You can either listen with the built-in speaker, or with your headphones through the 3.5 mm headphone jack. Lots of tuning options. This radio allows manual tuning, rotary tuning, tuning through direct frequency, auto scan tuning, and tuning through memory recall. That is a total of five different methods for tuning your radio. Comes with all needed accessories. These include a set of earbuds, an AC adapter, an SW antenna, and a convenient carrying pouch which is perfect for portable use. Useful display. The backlit screen is easy to read even in lowlight conditions. It provides helpful information, including the call letters of FM radio stations. This can be very useful if your signal is cutting in and out, and you cannot catch the station ID. Good sensitivity and reception. While there are some radios which offer better, for the price, the quality is pretty good. Some units may not last very long. In some cases, these radios have been known to fail within a couple of years (sometimes even less time than that). I’ve been seriously looking at the Pl880, but then I ran across your comment “Other portable shortwaves doe a better job of filtering out interference.” Which other radios? Is there a website when I can see a side by side comparison of the top portable radios? Thanks. PL-880 is a pretty good choice, I wouldn’t disregard it completely because of the comment. Sony ICF-SW7600GR is another option you may consider.